With flowers budding everywhere, balmy sunny days and the greenest, best- watered fields to be seen in years, it feels as though a vibrant early springtime has arrived in West Sonoma County. Meanwhile, perched on the picturesque Laguna of Santa Rosa, our community’s new hospital is experiencing its own unexpectedly early fiscal spring. Based on the Sonoma Independent’s analysis of financial data from the new Sonoma West Medical Center (SWMC) for the month of January and first week of February, it seems clear that the new hospital has succeeded in its goal of keeping wages and supply costs down while surpassing its revenue target. Nevertheless, SWMC faces a short term cash flow crunch during the next four to five weeks. This has not been caused by operational losses (the revenue that the hospital conservatively expects to receive through insurance reimbursements and patient payments minus all operating costs). As shown in the two pie charts above, if you exclude pending insurance payments and un-compensated care provided prior to insurance re-certification, SWMC’s losses were under $200,000 for December and January. This $4.5 million of reimbursed cash will flow back to the hospital starting in March. Meanwhile, nearly $12 million in community philanthropy has run out, and bills still need to be paid. That’s why the hospital requested $600,000 in bridge financing at the February 1 District Board meeting. The Board voted to provide $500,000 at the meeting (thanks in part to a petition with 330 names by the new Friends of Sonoma West Medical Center, as reported here). The funds came through a few days later, although the amount had been trimmed to $400,000. To make it through this csh crunch period, private loans and grants are being arranged by SWMC to cover the next few payrolls. 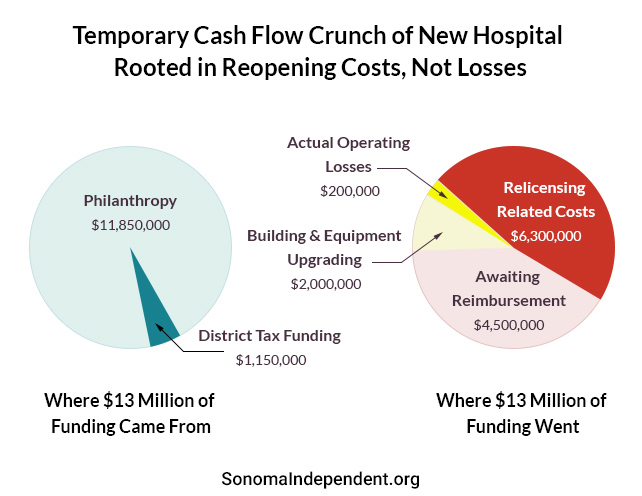 Reining in the runaway expenses of the financially mismanaged Palm Drive Hospital was the first order of business in organizing the new Sonoma West Medical Center. A fiscally-focused new 14-member SWMC Board was created, headed by community business leader and lead philanthropist Dan Smith. Smith knew exactly where tight controls would be needed for SWMC to be profitable. Salaries and benefits at the average California hospital are typically about 50% of gross monthly revenue. According to District records, in January 2014, shortly before the Palm Drive Health Care District Board voted to close it, salaries and benefits had hit 72% of revenue. 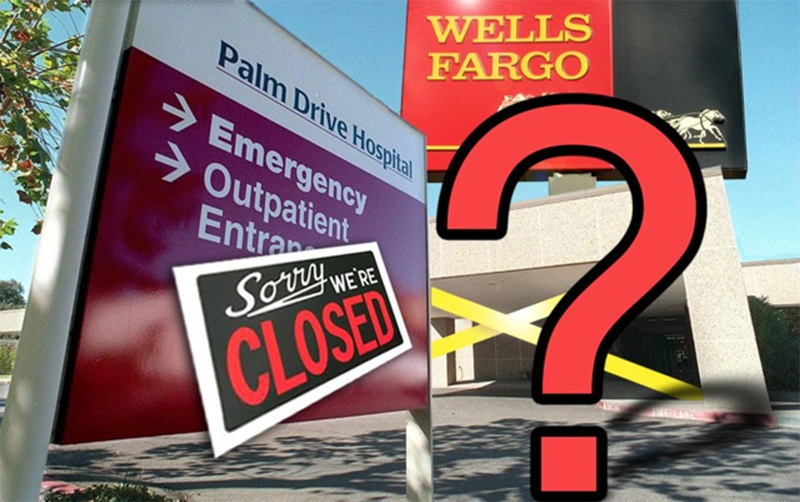 As a result, Palm Drive Hospital losses for the month of January, 2014, soared to a record $585,000. “These are the kinds of things you see in a fiscal environment where nobody’s minding the farm,” SWMC Board Smith said. Smith and others have been carefully minding the farm that has become the Sonoma West Medical Center. In January, 2016, its first month of Medicare reimbursement eligibility, the hospital’s operational loss was around $200,000. For Feberuary the hospital is exceeding its projected daily census, with more surgeries performed and scheduled than last month, and scores of women coming to SWMC for one of the only 3D mammography procedures in the County. The month of February thus far suggests that revenue projections will be surpassed by well over 10%, creating a monthly profit at this District hospital for the first time in years once insurance reimbursements arrive. Smith and his team are working to bring SWMC’s salaries and benefits close to the statewide average of 50% of hospital revenue and 13% of revenue for hospital supplies. SWMC’s supply expense of under 13% for January 2016 hit this important milestone, and compares favorably with Palm Drive’s wasteful supply expense of 20% of revenue in January, 2014. The new hospital is achieving these savings without sacrificing the level of personal, expert care that caused Consumer Reports, in early 2014, to rank Palm Drive Hospital as the number one of 360 California hospitals for safe outcomes, and the 5th safest in the entire United States. This week, Sonoma West Times & News, a widely-read West County newspaper, shocked citizens by publishing a front page article titled, “Fears of third hospital bankruptcy grow.” The article was written by Rollie Atkinson, publisher of the Sonoma West Times. His article did not bother to analyze the January figures that SWMC provided the public with last week, showing that it had cut expenses by hundreds of thousands of dollars compared to Palm Drive’s numbers two years ago. Nor did it quote or refer to a single person who expressed “fears” of a hospital bankruptcy, thereby violating a core journalistic principle–especially when presenting such a potentially damaging headline. The four part award winning investigative series that I wrote in 2014 about Palm Drive’s closing and reopening concluded with an article about the Sonoma West Times’ campaign of deception. Titled, “Sonoma West’s Relentless Vendetta to Stop Dan Smith from Re-Opening Palm Drive Hospital” and readable here, it chronicled a number of instances in which the newspaper distorted the hospital story to promote a damaging narrative with little or no basis in truth. 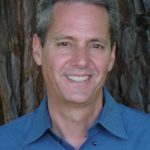 Last year, a half dozen members of our community formed a new non-profit, Informing to Empower, which launched the Sonoma Independent as a public interest website in April, 2015. Informing to Empower’s mission is to provide transparency and insight into complex issues that impact the public interest, like the future of our community hospital. Challenging narratives like “citizens are powerless” and “failure is our only option” with analysis and insight into solutions is what public interest media–and the Sonoma Independent–is all about. “In your coverage of the rebirth of our district hospital, you have proven that your newspaper is a powerful force in our community. Your editorials, headlines, opinion pieces, and selection of letters have had a major effect on its process. The commentaries you’ve published have made it difficult to raise money for the hospital and have discouraged people from contributing to its success at a critical time. “Your recent headline, “Fears of Third Bankruptcy Grow,” came as a surprise to everyone who knows that the hospital is on a path to success with rapidly growing revenue. Since there was no mention of bankruptcy at the meeting you attended, and since you did not speak to a hospital administrator, and did not quote anyone as being fearful, this appears to be another personal opinion instead of news. “If you had inquired, you would have found that Sonoma West Medical Center is already exceeding Palm Drive in patient census, ER visits and outpatient visits. For example SWMC had 433 inpatient days in January vsPalm Drive’s average of 344/month, a 26% increase. SWMC had 573 ER visits in January compared to Palm Drive’s average of 496, a 15% increase. This week kicks off the 3D mammography program, more elective surgery and other programs, all of which will add to the hospital’s success. “We were dismayed to see the February 11 edition of the Sonoma West Times with a most misleading headline peeking out of the newspaper box. This headline was a complete abrogation of journalistic principles substituting a malicious intent to discredit our hospital for accurate reporting of the facts. The headline Fears of Third Hospital Bankruptcy grow had little relation to the article underneath or to the facts.